The Seoul Arts Center on Wednesday began a run of director Lee Su-in’s “A Black Box,” a 2017 play written by Lee Kang-baek. The story was inspired by a real picture of King Gojong that was presented to a US president’s daughter, who is known to have made belittling remarks about it. Alice Roosevelt Longworth, daughter of US President Theodore Roosevelt, mentioned the picture in her autobiography, titled “Crowded Hours.” In the book, she wrote that King Gojong and the crown prince had both given her their photographs. In Lee’s fictional narrative, the dead king appears in a dream to court photographer Kim Kyu-jin. King Gojong tells the photographer to destroy the photograph, saying he cannot rest in peace otherwise. 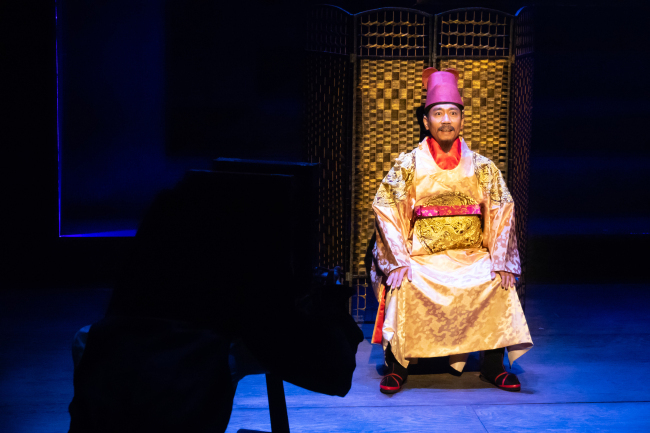 The four-act play focuses on the Kim family’s century-long efforts to track down the photo, from one generation to another, until the dead king’s wish is fulfilled. According to the playwright, the photo symbolizes the humiliation and suffering of the Korean people during Japanese colonial rule. Its destruction, he said, symbolizes a new era, perhaps one of healing. Lee, born in 1947, is an iconic playwright of his generation. He began his writing career in the 1960s and is best known for his use of allegories in constructing his narratives, often weaving Confucian values into his works, including filial piety and humaneness. In Lee Su-in’s production, court photographer Kim and his son, grandson and great-grandson all make sacrifices to fulfill the king’s order -- or perhaps for the cause of the victimized nation. Each son struggles to fulfill his father’s wishes. The sons strive to retrieve the photo at the cost of life, marriage and love. Some may see their noble efforts as embodying the endeavors of generations of people throughout the 20th century who fought to reclaim and rebuild the nation. “I did not have any political or historical account in mind, when directing the play. It would be rather relevant to consider that there is this way of looking at our past,” said director Lee. But the nationalist message may be difficult for some audience members to relate to -- particularly younger people, who have little sense of connection with the sufferings of the past. “A Black Box” runs through Dec. 2. The play is in Korean, with no subtitles.